Since our DIY printables have become so popular with our customers and blog visitors, we’re doing a little something for St. Patrick’s Day (17th March) as well. Whether or not you plan to be a part of the parade this year, you can still observe St. Paddy’s Day in the office by bringing a little bit of that Irish good luck to your place of work – and it can be another great way for people in office to have fun and bond with your co-workers. Once you have all your stuff in place, take a look at the various St. Paddy’s Day printing options that we have here. You can use any or all of these to create lovely St. Patrick’s Day themed décor for your home or office. Simply click on the link to print out the PDF’s. Now carefully cut along the dashed lines provided to get the right shape. You can now use these decorations in various different ways: you can punch holes in each printout and string them together across the office, or you can use double sided tape to put them up on walls. You can even paste them on to individuals’ desks or work stations to create a lovely green theme for the day. 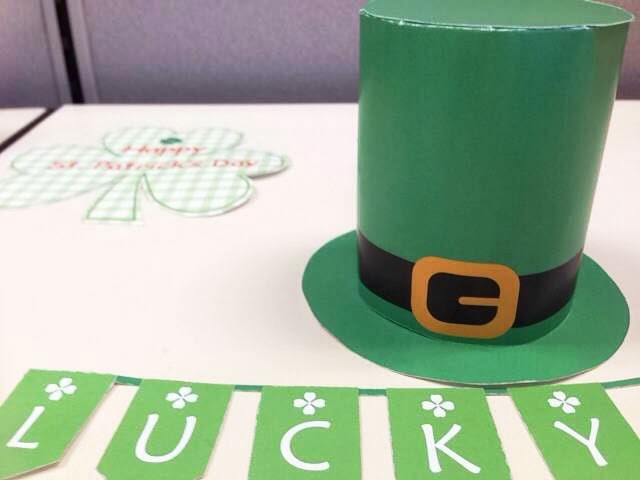 You can also encourage people in office to bring along their own little green hats or leprechauns. To know more about our fun printables, like us on Facebook and join our mailing list for special discount offers on ink & toner.